Thanks to all for your well-wishes this past few days. My mother had surgery on Saturday and is recovering. Now we wait to see how it all shakes out in the long-run. For now, I am back in LBB for a few days, preparing for next week's start of the spring term. As usual, I am excited and ready to get it under way. Unfortunately, weather and life got in the way of starting work on the compost fence during the break, so it will have to wait for a free (and warmish) weekend after classes start. I need to get it constructed as the first step to preparing the farm for chickens, since they could easily hop over the current fence separating it from the main backyard and into the waiting mischief of the dogs (don't ask me how I know this). After I get the fence built, I'll start on the coop. It's a lot to do during what will be a busy spring, so here's hoping for at least four free weekends. No, really. One way to keep it out of the landfill (or sewer system) is to use some of that left-over paint for other projects--hence my color choice for the pull-out shelf, Laura Ashley Gold 3. (It could have just as easily been Dover White or Desert Sage.) The paint was several years old and had the consistency of tapioca (I spread it out with a paint stick like I was buttering a piece of toast before using a roller. And yes, I know that is a gustatorial mixing of the metaphors.) It didn't level out the way new paint would, and left a kind of very fine pebbly surface, but this is a work table, so I don't really care. Using as much as you can of the material you purchase also works for the other toxics we have lying around the house--the pesticides, soaps, bleach, etc. Try not to buy more than you need, and use all that you buy. 2) Open the can and let it dry out. 3) Spread it out on cardboard and let it dry. Treated this way, it took a half-full gallon can of latex about 24 hours to dry in the summer heat and about three days for an oil base paint. Our only real problem with this method was finding enough cardboard, but the local supermarket happened to have a cardboard recycling bin ripe for the picking, so even that minor hiccup in the process was not insurmountable. Once the paint on the cardboard dries, you put it in the dumpster to be hauled away. Yes, I know it is going to the landfill, but at least it will be stable when it gets there. 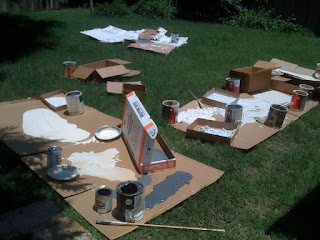 To minimize how much painted cardboard ends up in the landfill, see tip number 1. It seemed a daunting task safely to get rid of all those cans of paint, and in fact it was. I won't lie to you. It took days, and I wanted to weep with despair when I realized the enormity of the job. But it was also do-able. I'll confess that I've been on a bit of a tear here at my own house every since my siblings and I had to clean out my parents' house this past summer. Closets have been purged. Clothing has been culled and given away. Books have been removed from the shelves and carted down the the library donation box. But I have my own closet of squirreled-away left-over paint which I still need to address. It isn't going away by itself and I am not at all excited about dealing with it. The good news is that I am down one less can after making my pull-out shelf. *This does not work for pesticides, however. Most cities and towns have specific ways in which they want you to take care of these household toxics--some better, and some worse. I am going on record here and saying that LBB's is abysmal, very unhelpful, and virtually non-existent ("We don't want it. Fend for yourself. "), while the town in which my parents lived is actually quite good ("Box it up, place it on your front porch, give us a call and we'll pick it up for you."). Super tip about spreading the paint out on cardboard. Makes me wonder why I couldn't have thought of that. When I have over purchased paint in the past and had that nearly full gallon to contend with I've taken it to our local Re-Store. They add it to their stock of building materials and hopefully my blunder will be some other persons "just right" can of paint. I have gone there myself when I've needed just a little for a project and didn't want to buy a full can. Thank you for the thoughtful tips and I hope your mom makes a full recovery. PS: I'm watching your compost bin project because I have a stack of pallets that I think I may be able to fashion into a large bin. I've let the old paint dry and it does take a LONG time if you don't pour it out! Great tips. Donate your paint to a school. Meg's school she teaches 5th grade there. They have a caged room full of left over paint. The kids don't care at all either. They paint cardboard all the time! We have bought full gallons at the re store (Habitat) for $2. Wow, great tips! We have a scary number of those cans in the basement... could take them to the toxic waste place in town but too lazy. I keep thinking they will come in handy, some actually did when I re-painted the porches in the fall! Glad to hear your mom's on the mend, and that you are taking a lesson from the long and painful house clean-out and doing what all of us should do - deal with our own messes so someone else doesn't have to! And I say this as a horrible pack rat who has a looooong way to go on doing better in that respect, despite some feeble attempts around New Year's. If you paint a non-porous surface, dried latex peels up and becomes very small indeed. This minimizes the amount of stuff in the landfill. This way, you won't have to use up perfectly recyclable cardboard. The trick is finding a material that will let you spread latex and yet won't stick to the latex. Waxed surfaces and plastic work. One might just pour the latex onto the surface, let it dry and then peel it up. Don't do this for oil-based paints. Meadowsweet--I don't think we have a Re-store here, but it sounds very intriguing. What a great idea! Kirsten--thanks for the link. I checked it out and it looks very useful. EG--Well, that's what the solid waste disposal website suggests. It makes sense, too, if you consider that it is stable when painted and dried on your house, too. Hey Little Bro--great tip and an excellent point. Might not have worked this summer, though, given the volume of paint to deal with. That cardboard was needed. Might try it on my cans of paint this summer, though. Have a safe trip back to VA and hope your cold is too terrible. Hi there again, another thing occurred to me on the drive, when you apply the paint for drying, just pour it. There's no sense in wasting resources on brushing it. We were able to get rid of 20 years worth of paint recently, most of it from the former owners. The city, rightfully, will not let you throw it in the trash container, but you are allowed to drop off no more than 5 gallons at a special site on certain days. After November's Nor'easter the city found itself dealing with tons of ruined household goods, furniture, etc... They set up convenient drop off sites where they also had paint amnesty days with no quantity restrictions, and we sure took advantage of it.